More than £742,000 is being invested to improve Limavady town centre. The investment will deliver public realm upgrades along Connell Street and Irish Green Street and a revitalisation scheme for Market Street. The Department for Communities is providing £721,000, with a further £21,300 being provided by Causeway Coast and Glens Borough Council. Communities Minister Paul Givan said the funding “will promote and further improve the appearance of the shop fronts”. 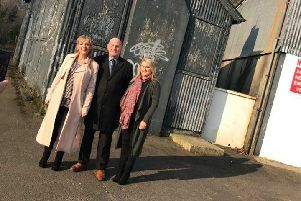 The Department for Communities is investing £371,000 for public realm improvements along Connell Street and Irish Green Street. A spokesperson for the Department said these will include an upgrade of the footway surfaces, kerbs, street lighting and to resurface areas of the carriageway. The public realm improvements will be delivered by the Department for Infrastructure’s TransportNI. Infrastructure Minister Chris Hazzard said:the “much needed” public realm schemes in Limavady will “considerably enhance the physical environment of Connell Street and Irish Green Street which will benefit the local community and visitors to the town for many years to come”. A further £350,000 is available for the enhancement of retail premises in Market Street. The Revitalisation scheme has been jointly developed by the Department for Communities and Causeway Coast and Glens Borough Council who are providing a further £21,300 towards delivery of the project. The project will include the installation of new shop frontages, painting, replacement of rainwater goods and repairing or replacement of windows, doors and external plasterwork. She said the funding “is a great opportunity for the town’s retailers to enhance the quality shopping offer and individuality of this market town”. Work to upgrade the street lighting along Connell Street and Irish Green Street has already been completed and the upgrades to the footways and carriageways are expected to be completed by March 2017. The Revitalisation works are currently being designed and are not expected to fully complete until summer 2017.